This area of the past will look pretty bleak, everything is covered in ice and there doesn't seem to be much life anywhere. But if you head to the east and onto a sky bridge you'll find yourself up in the clouds where a mystical city is. You will meet a boy, you know very well, in one or another way. The first city you'll reach is called Enhasa. Talk to the people there, and one of them will hint at a doorway of destiny hidden in there somewhere. You'll also meet a rather sullen boy who predicts one of your party will shortly perish. You'll also learn of the Blackbird and the north palace where elemental weapons are sealed, which may look suspiciously like a pyramid-shaped structure you've seen in the present. If you'd like to test yourself (save outside first) with a fun, and rewarding, little battle. Open the elemental books within Enhasa in this order: Water (upper right corner), Wind (upper left corner), Fire (entrance). A book case will lower, head through the door. You'll find a Nu; speak with him and ask to be tested. It is recommended that your party be over level 25 to make it easy. There are two types of Nu. One type of Nu reduces your hit points to 1, regardless of how many you have. These Nus are the left and right Nu in the top row and the middle Nu in the bottom row. The remaining three Nus will only ever inflict 1 point of damage. If you want to guarantee a win, simply heal if you get reduced to one health. The best tactic is to have 3 magic users and have them all cast their level 2 elemental magic tech, that way you can win in 2 rounds (2 hits from each character). You might not even have to heal if you do it that way! After beating the Nu's you will receive a large amount of XP and TP (744 and 90!) and both a Magic Tab and a Speed Tab. You will meet also Dalton, another Char from this timeline. Head north from Enhasa, take the Land Bridge (which will transport you to the land below) then head north again and take the Sky Bridge back into Zeal to find a new area up in the clouds. You can visit the great ship Blackbird which was built by the guru Belthasar, the city of Kajar where magic is studied and a cave which leads to the palace of Queen Zeal. If you go to the Blackbird and talk to the soldiers standing guard, a cutscene will ensue where a man name Dalton accuses you of being those whom the prophet had predicted. His maniacal laughter and hostile language lead one to believe your party is in danger; luckily he leaves. Head into Kajar and you'll learn about the sun keep, and how all the people living in the clouds know magic while the earthbound ones don't (those exiled below on the land). You may notice a blinking blue dot in the upper right portion of the screen. You won't be able to pick it up directly, but go in the upper right hand door and check the bottom right of the screen in the next area to grab it, a Speed Tab. You'll learn more about the sun palace and how the sun's energy can be stored in a sun stone, and how a moon stone can be charged into a sun stone. You'll also find a man responsible for making Magic Tabs, although he won't let you have one. The most important thing you'll get here however, is a clue from a sleeping Nu: "water summons wind, wind makes fire dance." Again, open the books in order (water, wind, fire) to open a secret room. The locations are: water in the top left, wind in the bottom right, and fire on the north side of the table/desk surrounding the Nu vendor. A nearby bookcase will lower, enter to find a diary talking about Dreamstone, and to receive a Black Rock from the Poyozo in the middle. The Black Rock is an accessory which, when equipped, unlocks a Triple Tech called "Dark Eternal," however you only have two characters who can equip it. Interesting, don't you think? 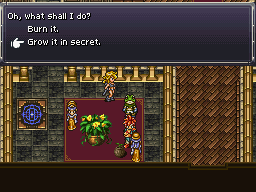 Tell her to grow it in secret and you'll open up a sidequest in 600 A.D.
Head east from Kajar and enter the cave at the base of the mountain. Ride the light up, cross the bridge and head through another cave to get to Zeal Palace. You'll learn that Lavos is the source of the energy used by the Enlightened Ones, which they channel through the Mammon Machine. Talk to everyone, but know that there are actually a few important things to do here: talk to the girl in the bottom left who's holding a plant, tell her you like plants, and tell her to secretly plant the sapling given to her by the Guru of Life. (If you fail to do this now, the same woman will be in the Village Commons after you complete the Blackbird.) Also, talk to the Nu and agree to scratch his back to learn his "secret scratch point". If you go back to Kajar and talk to the Nu in the room with the tabs, you'll be able to scratch his back for a Magic Tab. Head to the northeast door to learn a little bit more about Schala and Janus, and head through the center door to watch Schala use her pendant. You'll learn that the pendant, along with the Mammon machine are made out of dreamstone, and that your pendant resembles the one the Gurus made for Schala, hinting that it may be the same pendant passed down into the future. Go to charge up your pendant at the mammon machine through the left door, but be warned that once you do there's no going back to the other cities. You'll be able to return to this area much much later, but once you charge up your pendant you'll have to wait a while before visiting the secret rooms at Enhasa and Kajar or scratching the Nu for a Magic Tab. Use your charged pendant to open the door with Zeal's crest on it, and prepare to fight a Golem. Iron Orb: Cuts the targeted character's HP in half. You can actually lose this fight and the game will proceed as usual, but if you want to win it, just be aware that it copies the style of whatever attacks you last used on it (similar to Magus' barrier changes): physical, lightning, etc. Its physical attacks are really nasty. One of them cuts a target party member's HP in half. Others do massive damage. Its lightning and shadow attacks hit the whole group for large damage, but its fire attacks are fairly impotent, particularly if you have ruby vests. It attacks at fairly predictable intervals, so attack with whatever powerful spells you want first, but always finish up with one of Lucca's fire spells to guarantee that it will hit you with a weaker fire attack. Its final attack when it dies will be to copy Dalton and hit the whole party for about 100 damage, so keep your health up. You'll be trapped no matter what the outcome of the battle is, and eventually Schala will free you but the prophet will send you back through the time portal and seal it behind you. You'll be back in 65M B.C., just head to the End of Time and get on to the next chapter. If you go back and challenge Lavos at this point you should get The Prophet Ending. There will be a few scenes involving "the Prophet" from this period and a particularly nice speech from him, hinting that he would have gotten the chance to do what he wanted without your interference. 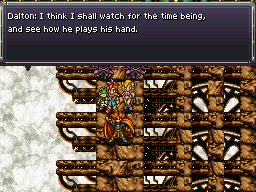 However, if you challenge Lavos right after Schala charges up her pendant but before charging yours, you will get an unusual ending known as The SlideShow Ending. 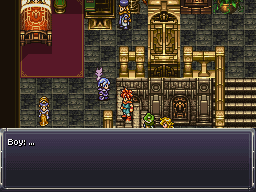 Marle and Lucca will provide commentary on the studs and duds of Chrono Trigger, and Crono will actually speak. This page was last edited on 26 April 2017, at 20:22.